Against the backdrop of budget constraints, threats from terrorism, organised crime and public disorder continue to rise. Authorities can remain resilient through the targeted application of technology. Advances in face recognition coupled with the mass availability of digital media and continuously cheaper computing provides unique opportunities to enhance the efficiency of forensic investigations to enhance public safety. Processing of digital media can be automated in a virtualised and elastic computing environment to identify and extract actionable intelligence. Processing is scalable, continuous, consistent and predictable. Analysts can focus on investigating and confirming suggested results rather than watching countless hours of media in the hope of stumbling across intelligence. Such a centralised platform can also be used to search in near real-time faces from any number of remote cameras against centralised watchlists of individuals of interest. Fighting Terrorism With Facial Recognition. Risks are increasing. Recent events demonstrate that the threat landscape is substantial and becoming more fragmented, consisting of a greater number of smaller and less sophisticated plots. The targeted application of technology can play a key role in improving the efficiency of our police and intelligence agencies and maintaining readiness to both disrupt and respond to major events. Digital Forensics (confiscated phones, computers, flash drives etc). Open Source Intelligence (Internet and Dark Web). Crowd- sourced from members of the public (HD cameras on mobile phones are ubiquitous). When tragic events or social disorder occur, investigators have a long and arduous task of reviewing countless hours of media, generally with a varying degree of concentration and scrutiny. A solution that minimises manual effort in the extraction of actionable intelligence from amassed media by automating this process with a consistent and repeatable level of scrutinywill deliver concise and consistent information in a fraction of the time taken by operators undertaking the task manually. 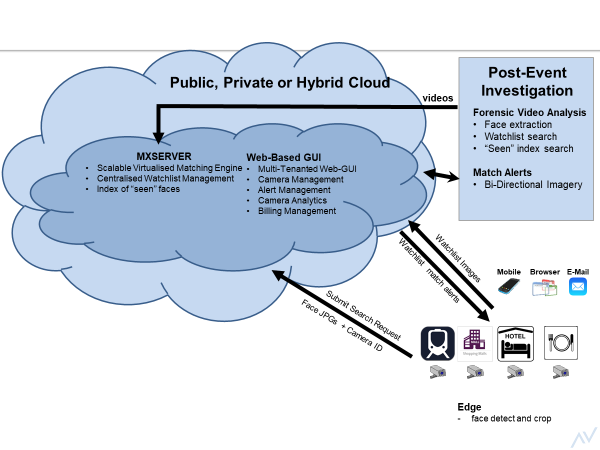 Police, intelligence and other public order agencies can benefit from the application of a powerful media processing solution designed to ingest, analyse and index, in an automated fashion, very large quantities of media from multiple sources to transform them into usable assets. Utilising virtualised and elastic computing environments enables the platform to be rapidly scaled up and down in response to unfolding events. Once processed, agencies can analyse and make use of the extracted assets and manage them in a centralised repository of information. Data links, associations and metadata inferences can be managed across the whole dataset by multiple users from a single common user interface. Backend processing services are run in a cloud-computing environment, the capacity of which can be configured and incrementally scaled up and down to meet an organisation’s changing demands; peaks arising from specific events can be easily accommodated. Create and manage watchlists of people of interest. Use of metadata (including geo data) to enhance investigations and association of data. Integration into existing system environments, databases and components. Biographic filtering and Fuzzy Match capability. Vendor independence allows the use best-of-breed algorithms. Newer and better algorithms (COTS and GOTS) can be plugged in without having to replace the entire platform. Compartmentalise and refine analysis by location of media creation. Overlay location of proposed matches onto maps. Chart movements of individuals of interest by location and time of sightings. Link individuals at the same location and time even if they do not appear together in media. Flexibility in customisation and integration with existing systems and workflows. Well-defined mechanisms of loading data and automating ingestion of media. Dynamic alteration and sharing of watchlists, media, system-generated results and operator analysis. Take advantage of IaaS and SaaS options on public sector hosting offerings. Fully self-host the solution on private and secure premises and datacentres. Deploy in a hybrid manner. Indeed, managed AWS or Azure offerings can be utilised to bulk process media, utilising non-return gateways to propagate identified sensitive data to more secure facilities. Humans will always remain the critical and essential part of intelligence analysis; such solutions do not replace the intricate skills and knowledge of trained investigators. Rather, the operator is enabled to intelligently direct and apply their training at suggested results, eliminating the necessity of rote viewing of countless hours of media either in a sequential our random fashion. Integration of enhanced verification, charting and mapping tools enables operators to conduct detailed analysis of suggested matches and identifications. Often, authorities need to quickly process evidence to identify and apprehend individuals. The scale of the investigation can be huge and the amount of media that needs to be processed massive. The media acquired in these instances can be of such critical importance that the authorities may choose to review it all in its entirety. However, immediate and decisive action is critical. Rather than sifting through the media in a random or sequential fashion, a media analysis solution can quickly direct the investigators to portions of the media that are most likely to deliver immediate results. Full review of the media can be conducted afterwards. Military or counter-terror officers raiding terrorist facilities. Specialist organised crime investigators raiding organised crime offices. Child protection officers raiding premises of individuals or organisations involved in child exploitation. Automating processing provides investigating officers an overall summary of the contents including focus areas for further investigation. Authorities may as a matter of routine have access to masses of media which may contain actionable intelligence, but typically would never be viewed or processed due to a lack of resource. Intelligence in this media may be missed entirely and never acted upon. This media can now be bulk ingested and processed in an automated fashion to flag relevant intelligence, using operator controlled criteria, to the authorities as required for follow-up processing. Routine and automated processing of accessible media can flag actionable intelligence that may help disrupt future attacks. 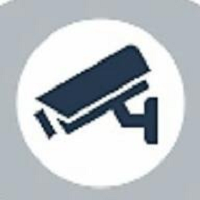 By integrating any number of remote surveillance cameras to such a centralised matching platform eliminates the need to install and maintain costly local software and hardware to perform local face matching as well as the need to store potentially secure watchlist data locally at the camera locations. The problems associated with live streaming of HD media over low bandwidth network connections is resolved through the application of local face-detection and cropping; only small image files of cropped faces need be sent to the central data centre over encrypted channels. In addition to submitting search probes to the server for searching against one or more watchlists, search probes can be enrolled in a “seen faces” archive which can be interactively or automatically searched (using face recognition) by investigators or when submitting videos for processing. The solution can be made available using a compelling SaaS model. The open and standard nature of the solution ensures it can run in existing on-premise datacentres or outsourced to secure hosting partners. Whilst the human operator is an essential part of intelligence analysis, an entry-level system empowers the analyst to process up to an order-of-magnitude more media on a daily basis. This enables trained operators to apply their expertise in a more focussed manner than manually watching hour upon hour of media. Efficiency is dramatically boosted by bulk processing media 24×7 at a constant and predictable level of focus and accuracy: operational staff can focus on analysing results. Security concerns are increasing whilst budgets are limited. The focussed application of technology can improve efficiency and aid law enforcement agencies to rise to this challenge. The massive increase in the creation of digital media and the availability of cheap computing provides authorities with the ability to bulk ingest and process media in an automated fashion. Results are continuous and predictable. Trained analysts can now focus their skills on investigating suggested results and on intelligence extracted by automated systems. Not only does this provide the ability to process critical media even faster than ever before to respond to time critical investigations, but it also enables authorities to extract intelligence from media sources that in the past may never even have been looked at because of the significant resource this previously would have entailed. The same centralised platform can also be used to search in near real-time faces from any number of remote cameras against centralised watchlists of individuals of interest.